[PTT TERBIN T] น้ำมันหล่อลื่นเทอร์ไบน์คุณภาพสูง ที่มีคุณสมบัติในด้านการต้านทานการเสื่อมสภาพและทนต่ออุณหภูมิสูง ทำให้สามารถใช้งานในระบบที่ต้องเจอความร้อนสูงได้ยาวนาน รวมทั้งมีคุณสมบัติพิเศษในด้านป้องกันการสึกหรอและป้องกันการเกิดคราบโคลนและวานิชที่เกาะตามชิ้นส่วนต่างๆ Premium industrial turbine oils which offer unique combination of oxidation and thermal stability which results in long drain interval and provide high performance wear protection along with sludge- varnish prevention, superior demulsibility and low foaming formation to maintain turbine efficiency. • Suitable for industrial steam or gas turbines and can be recommended for water turbine lubrication. • Various application where rust and oxidation prevention is required. 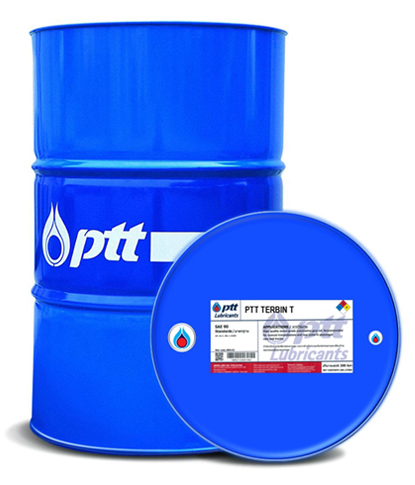 • Provide oxidation stability and long service life. • Minimize sludge formation and filter blocking.